This section provides a tutorial example on how to export an HTTPS server certificate to a certificate file in PEM (Privacy Enhanced Mail) format, also called Base-64 encoded X.509 format. In previous tutorials, I learned how to view an HTTPS server certificate and its certificate path. Now I want to learn how to save a server certificate to a certificate file. 1. Run Chrome 40 and go to https://login.yahoo.com. 2. Click the lock icon at the left side of the URL address area. The page security dialog box shows up. 3. Click the "Connection" tab. The connection security information is displayed. 4. Click the "Certificate information" link. The Certificate dialog box shows up. 5. Click the "Details" tab and click the "Copy to File..." button. 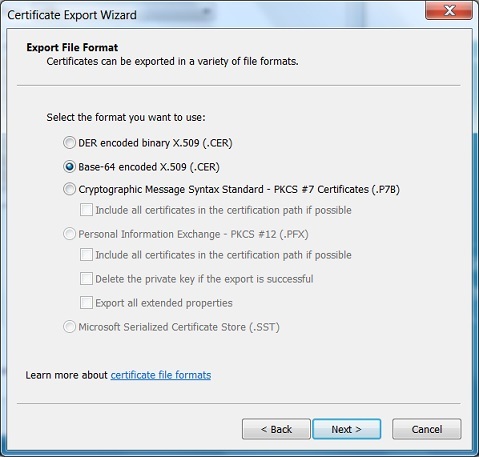 The "Certificate Export Wizard" dialog box shows up. Certificate can be exported in a variety of file formats. 7. Select "Base-64 encoded X.509 (.CER)" as the export file format, and click the "Next" button. The File to Export step shows up. 8. Enter a file name: \temp\yahoo.cer, and click the "Next" button. The confirmation step shows up. 9. Click the "Finish" button. The Yahoo server certificate will be exported into the specified file.